We began using social media in our marketing efforts at Sewickley Academy during the 2008-2009 school year. We launched our Facebook page and Twitter account thinking that social media, by itself, would help our enrollment efforts. We quickly realized that using social media by itself could get us more likes, comments, shares and clicks but it won’t necessarily get us more inquiries, applications, or visits. Because social media by itself can’t convert visitors into inquiries. And I should know, I’ve tried. There are distinct and specific steps a school should use when implementing an inbound marketing strategy at their school. Define the Persona(s) you are trying to attract. Identify the Keywords you want to rank for in search engines. Conduct Search Engine Optimization (SEO). Create Content to attract your desired persona(s). Use Social Media to promote your content, engage your persona(s) and drive people back to conversion points. The final step in that process is the key – drive people back to conversion points. Conversion points include your website and/or blog where you have inquiry forms which can convert anonymous visitors into admission inquiries. A visual I like to use for this idea is a wagon wheel. The center, or hub, of the wheel, is your website and/or blog. The spokes of the wheel are your social media channels that drive ito the center in order to convert. The wheel around the outside signifies cross-promotion between your social media channels, which is OK to do from time to time. I like to think this use of social media is geared toward attracting new students. The other way I like to think about social media is to retain the students we currently have. Focusing on retenion means that when I post or share to our social media channels, I’m not driving the students away from the social media channel but rather, I’m trying to keep them on that social media channel. We post content about our school that tells our story and reinforces our families’ decisions to re-enroll. Learn from my mistakes. 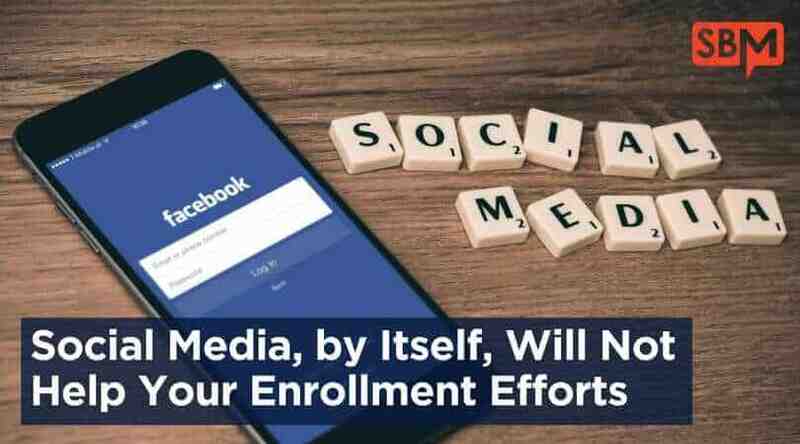 Social media, by itself, will not help your enrollment efforts. However, if you start to think of your social media efforts in these two ways you can begin to use social media for recruitment and retention.